Sven-Ivan Mella, who grows shiitake mushrooms in a disused office in an iron ore mine in Kiruna, Sweden, harvests fresh fungi off a log of alder wood. I visited the mine in May 2007. © 2016 text and photos, except where noted. All rights reserved. Reading “Deep Down Dark,” about the rescue of the 33 miners in the Chilean desert in 2010 (see August 29 post), got me thinking about the mines that I’ve visited on my travels, one in particular. In May 2007, I flew from Stockholm to Kiruna, Sweden, to visit the LKAB mine, the largest underground iron ore mine in the world. It’s owned by the Swedish government. Much of the Kiruna mine’s high-grade processed iron ore is used in steelmaking, and is exported to markets in Europe, Africa, the Middle East and Southeast Asia. In reality, the Swedish and Chilean mines don’t have much in common other than the obvious: They both are sources of a metal. In the San José Mine in the Atacama desert, copper and some gold were extracted. The San José Mine has been closed since the 33 miners were rescued and it is unlikely to ever open again. The LKAB mine in far north Sweden has a good safety record and it’s expected to continue producing for several more decades. My trip to Sweden started with several days spent visiting friends who live in a Stockholm suburb. But when I planned my itinerary, I knew I also wanted to go north, about 90 miles above the Arctic Circle, to see the area that is part of the traditional homeland of the indigenous Sami people, to check out the mine and learn more about why the central section of Kiruna was being relocated. This two-week trip also included several days on the gorgeous island of Gotland, to walk along the medieval walls that encompass Visby, a UNESCO World Heritage site, and undertake a lengthy self-guided ramble. The Atlanta Journal-Constitution, where I worked at the time, ran my extensive stories and photos in the June 17, 2007, Travel section. When I arrived, spring hadn’t, as the temperature was hovering in the 30s during the day and snow was scattered on the ground in many places. The sun did eventually come out, but not for long, and I remember more overcast sky and cold than anything approaching a change of season. There is an official LKAB mine tour, which can be booked through Kiruna’s tourism office. But I sought out a more informal, three-hour one, led by a retired electrician and software writer, Sven-Ivan Mella, who had worked at the mine for decades. I’d come across his name in several guidebooks, noting that his current specialty was growing shiitake mushrooms in a disused office in the mine. He picked me up at my hotel in a minivan and provided a lot of background information about Kiruna, the Sami, and the mine’s founding before we actually drove in. At the time of my visit, the mine had 248 miles of paved road. That number has likely increased as the downward digging into the magnetite ore has continued. The company’s website says the Kiruna “ore body” is about 2.5 miles long and about 1.25 miles deep. More than 1 billion tons have been mined since the late 19th century. Twenty-first century drilling has reached a level of about 4,478 feet, and LKAB officials expect the ore body to hold out for another 20 to 30 years of excavation. Not surprisingly, the roads in the mine were pitch black. The only illumination was the reflectors on the walls, and vehicle headlights. Fresh water is brought in via pipes, air is circulated by fans, and cables run for miles allowing all interior functions to be executed from banks of computers in state-of-the-art control rooms. Mella drove me to what looked like a workshop, where an enormous three-hole borer took up a great deal of space — and dwarfed everything around it. I even had a chance to climb into the cab and have Mella snap a photo of me in a white hard hat, with my hands on the controls. He said that this machine, too, was run by remote control, though a driver positioned it before someone pushing buttons from a distance took over. So how did the idea of growing shiitake mushrooms in the mine blossom? In 1988, Mella was part of a group at a symposium in Takikawa, Japan, on the island of Hokkaido. The topic of discussion was how LKAB and Kiruna’s workers had dealt with a round of wide-ranging job loss. His hosts showed Mella their shiitake mushroom farm, and a scheme was born. Back in Kiruna, it didn’t take much to persuade mine officials that a shiitake farm could be a success. Darkness: check. Water source: check. Surplus manpower: check. Secure the necessary start-up components: check. Using alder wood from a Finnish source, spawn and technical advice, Mella was on his way. In about six months he had his first crop, and at one point was harvesting more than 220 pounds of mushrooms a week. He said one of his proudest moments was having his shiitakes served as part of the 1992 Nobel Prize banquet in Stockholm. Since my visit, Kiruna’s railway has been rerouted and a new main sewer line is now operating. New apartment construction is under way, with some families already in residence. In 2001, Kiruna’s church was voted as Sweden’s most beautiful building. The red wooden exterior is in stark contrast to the overcast sky in May 2007 . The architect was Gustav Wickman. Completed in 1912, it was donated to the people of Kiruna by LKAB Mining. Over the next 20 years, about 6,000 people in Kiruna (current population is about 23,000) will relocate as a total of 3,000 new housing units are constructed, in addition to a commercial center and new public buildings. Historic buildings, such as the church that resembles a Sami hut and which dates to 1912, will be disassembled and reconstructed. The target date for completion is 2035. Souvenir iron ore pellets from the mine in Kiruna are smaller than the average marble. I came away from Kiruna with three unusual souvenirs: 3.5 ounces of fresh shiitake mushrooms, a recipe for cream of shiitake mushroom soup and seven gray-blue pellets of iron ore. My friends and I enjoyed the soup on my last night with them in Stockholm. The pellets sit in a small porcelain dish I bought at a market in Tokyo, on the same sideboard as my amezaiku bunny (see August 22 post). If you’re going all the way to Kiruna, check out the many seasonal outdoor activities available listed on the tourism website: http://www.kirunalapland.se. I wasn’t able to find any current contact information on Mella’s mushrooms, but check with tourism officials to see if he’s still growing them and if his tour is available. The tourism site also has links to dozens of beautiful photographs. Click on “press” at the bottom of the page. I make Holiday Apple Cake in the early fall, but it’s delicious any time of year. Every year at about this time, I make a gorgeous apple cake. The apple harvest, usually beginning in September, helps to signal that the hot and humid days of summer are nearly over, and that the beautiful colors of fall are on the way. The recipe itself isn’t difficult, but there are several steps and the prep is lengthy. Read through the recipe twice to make sure you understand the assembly. Unfortunately, I don’t recall the original source of the recipe, except that I photocopied it out of a book. I always use Granny Smith apples because their tartness offsets the sweet batter, and their firm flesh doesn’t turn to mush during baking. Making the cake a day or two in advance allows time for the flavors to mingle, while the crumb stays moist. You’ll also need the advance time to let the cake cool completely. If you get impatient and accelerate this step, the glaze won’t cascade down the sides properly. For presentation, choose a wide plate, platter or platform that will support the weight of this dense cake. Use both hands to carry the plate when bringing it to the table to serve. It is also important to have a well-constructed bundt pan. This is one of those instances where spending the money for the best equipment pays off. My sister bought me a fluted bundt pan more than 25 years ago. It’s the one I still use. It’s also splendid for pound cakes. Below is the Nordic Ware link to the cast-aluminum pan that is closest to the pan that I have. This cake makes a lot of batter, so make sure the pan accommodates 10 to 15 cups. It’s sometimes referred to as a 10-inch pan. You may be able to find it cheaper on another site, but make sure what you purchase is a heavy-duty pan, not a lightweight one. The heavier weight helps the cake to bake uniformly. The Nordic Ware site also shows other bundt-pan shapes and includes recipes. This cake is guaranteed to bring compliments, and likely a request for the recipe. An assembly line is an efficient way to construct the layers. The first layer of batter and the first layer of apples are in the fluted bundt pan. Wrapped tightly, the cake will keep for four to five days. Leftovers can also be frozen. Wrap individual pieces in plastic wrap, then encase in aluminum foil. That said, the cake is best when fresh. To prep the apples: Peel and core apples. Cut apples into quarters and then slice apples into pieces about 1/2-inch thick. In a large mixing bowl, combine apple slices, cinnamon and 5 tablespoons granulated sugar. Mix well; set aside. The apples will give up some of their juice while resting. To make the batter: In a very large mixing bowl (or the large bowl of a stand mixer), combine margarine or butter and 2 cups granulated sugar. Cream at medium speed until fluffy. Add eggs one at a time, mixing well after each addition. In a large bowl, sift flour, baking powder and salt together. Add to batter about 1 cup at a time and mix until combined. Scrape down sides of bowl as needed. Add orange juice and vanilla and almond extracts. Continue mixing until batter is smooth (it will be thick). This is the third and last layer of apples. Grease and flour a 10- to 15-cup bundt or tube pan. Shake out extra flour. Place a small amount of batter in the prepared pan. Arrange a layer of apple slices in a circle on top of the batter. Repeat layers until you have 7 total (batter, apples, batter, apples, batter, apples, batter). The bundt pan will be about three-fourths full. When it bakes, cake will rise almost to the top. If you’re worried about it overflowing, place bundt pan on a rimmed baking sheet before putting it in the oven. This is the fourth and last layer of batter, and the cake is ready for the oven. Preheat over to 350 degrees. Bake 1 1/2 hours or until toothpick inserted in the center comes out clean. Cool on a wire rack 15-30 minutes, then carefully invert on a large plate or serving dish. Cool completely before drizzling with White Glaze. Notes: You will have leftover apples. After making this cake for many years, I’ve cut back to 4 the number that I prep, and I still have leftovers. So enjoy eating them later. It will take some practice to get the ratio correct when layering the batter over the apples. Cover the apples completely on each batter layer, but not overly thick or you’ll run out of batter for the last layer. If this happens, don’t panic or give up. Remember that you’ll be inverting the cake and may be able to disguise the shortcoming. The most important step: Grease and flour the pan well. If not, it won’t come out in one beautiful piece. The glaze isn’t thick enough to disguise where you’ve tried to put it back together. That said, I’ve never had that happen. I repeat: Grease and flour the pan well. The fully cooled cake is ready for glazing. In a medium mixing bowl, combine confectioners’ sugar and dash of salt. Add enough liquid to form an icing of spreading consistency. Liquid choices can include water, milk, nondairy creamer, orange juice, lemon juice, brandy or liqueur. Add vanilla extract. If icing is too thin or runny, add more sugar and mix again. If icing is too thick, add liquid a little bit at a time until you reach the desired consistency. Using a spoon, drizzle a small amount at a time over cake, beginning at the crown. Icing will roll down sides and puddle on serving dish. If you’d rather not have a puddle, place wax paper pieces around the bottom of the cake stand or plate before putting the cake on it. Glaze the cake. When glaze is set, carefully remove the pieces of wax paper. An overhead view of the glazed cake. For this version, I mixed orange juice with confectioners’ sugar for a slightly off-white glaze. © 2016 text and letter. All rights reserved. It is September 2, 1945. At four minutes past 9 a.m., aboard the battleship USS Missouri in Tokyo Bay, Japan’s Foreign Minister Mamoru Shigemitsu, pen in hand, is leaning over a green cloth-covered crew mess table. On deck, surrounded by other Japanese representatives, military men, the Missouri’s crew and a bank of photographers and reporters, he formally signs the eight-paragraph Instrument of Surrender, marking the official end of World War II. His signature is followed by that of General Yoshijiro Umezu, who had wanted Japan to fight on even after the two atomic bombs were dropped on Hiroshima and Nagasaki the previous month. Umezu is at the ceremony under direct orders from Japanese Emperor Hirohito. The third and fourth paragraphs of the document, prepared by the U.S. War Department and approved by President Harry S. Truman, read: “We hereby command all Japanese forces wherever situated and the Japanese people to cease hostilities forthwith, to preserve and save from damage all ships, aircraft, and military and civil property and to comply with all requirements which may be imposed by the Supreme Commander for the Allied Powers or by agencies of the Japanese Government at his direction. Also signing for the United States is Admiral Chester Nimitz, and eight Allied representatives. The ceremony takes about 30 minutes. President Truman (right) displays the Instrument of Surrender on September 7, 1945. From left: Secretary of the Navy James Forrestal, Secretary of War Henry Stimson and General George C. Marshall. Photo courtesy of the United States Navy and the Harry S. Truman Library and Museum. The crew and others on board this day also receive a souvenir, a small card with a red Japanese rising sun background, “certifying the presence of (NAME typed in) at the formal surrender of the Japanese Forces to the Allied Powers” aboard the USS Missouri in Tokyo Bay, September 2, 1945. USS Missouri Captain Stuart S. Murray, later an admiral, has the cards printed aboard ship. The cards also feature the signatures of MacArthur, Nimitz and Admiral William Halsey, commander of the Third Fleet. Another historical item of note is also present: The American flag that flew atop Commodore Matthew Perry’s ship when he sailed into Edo Bay (as it was then called) in 1853, marking the beginning of Japan’s opening to the West. That flag contained 31 stars and was flown out specially in its glass case from the Naval Academy Museum in Annapolis, Maryland. This is the last letter Lois Simon receives as a single woman from her Army Air Corps sweetheart, Elliot Gordon. The next one is addressed to Mrs. E. Gordon. With the war over, Elliot and Lois married on September 12, 1945. Thousands of miles away, at Aloe Army Air Field in Victoria, Texas, Corporal Elliot Gordon is writing to Lois Simon, his teenage sweetheart. They have been corresponding for about 18 months at this point, as I’ve detailed in my unpublished manuscript, “Fondly with All My Affection: A World War II Love Story,” based in part on my parents’ letters. 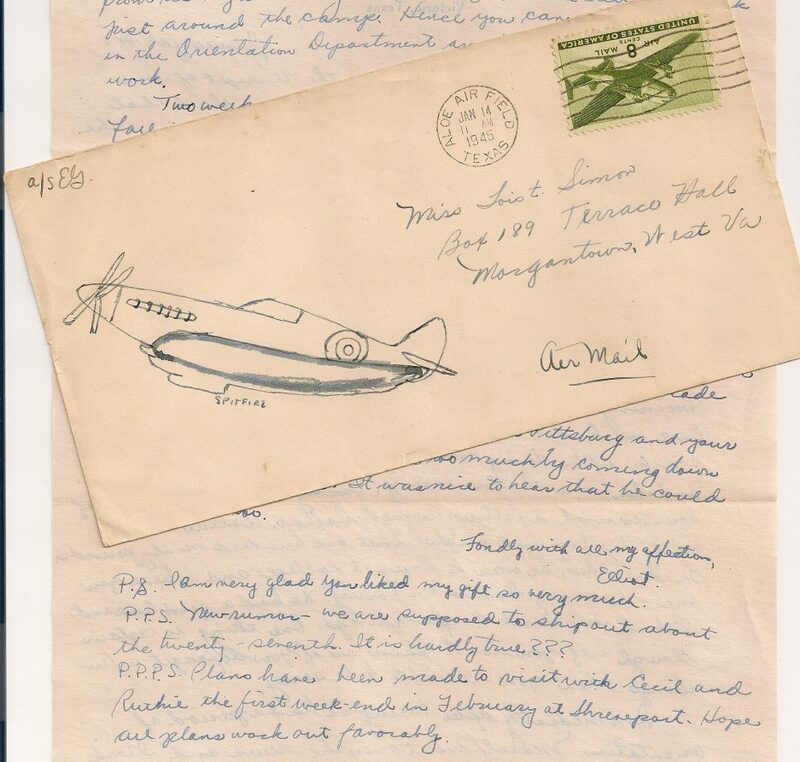 After meeting at a party in late 1943 — before Elliot is inducted into the service and Lois is still in high school — the pair exchanges more than 1,200 letters, cards and notes during the war. And dozens of photographs, too. With the war over, he has many decisions to make, among them, whether to remain in the military. And in the back of his mind, he seems to be trying to resolve Lois’s role in his life going forward. “Good morning darling,” 20-year-old Elliot writes to 17-year-old Lois, at home in Passaic, New Jersey, on Sunday morning, September 2, 1945. “Received your very blue letter darling; that coupled with a very grave and important decision still pending has caused untold confusion in my mind. There are few things I really want darling, few objectives I hold in life and now I’m on the threshold of a rather grave decision, a choice of either of two paths that threatens permanently or temporarily the few objectives I have. One of my aims darling is to be with you as soon as possible and for the longest period of time; primary as this wish may be, we both realize that it must be relegated to a secondary position when I consider my choice of courses. How I wish I never had to choose. Just days after writing this letter, Elliot is unexpectedly in New Jersey on furlough. While there, he does settle one matter: In a judge’s chambers in New York City, Elliot and Lois marry on September 12.